The ultimate compact 3-way studio speakers... the KS Digital C55 Active Studio Nearfield Monitor. 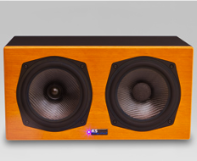 The C55 builds on the compact design of the C5 by doubling the cabinet and adding an additional woofer. It is the finest example of precision German engineering in sound; featuring a 180W bass amplifier, 180W midrange amp, 80W high frequency amp, 42 Hz to 28 kHz frequency response, and full dynamic range. Put them up against competitors twice their size, and you'll hear the difference that no phase distortion, super-accurate spatial imaging, and absolute transparency give you... the sonic truth. 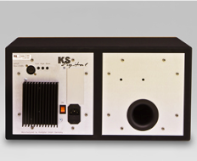 The KS Digital C55 is a self-powered, tri-amplified, full-bandwidth 3-way speaker. Contained inside is a handmade LF 6.5" carbon fiber woofer and 6.5" midrange carbon fiber waveguide cone, with a separately-mounted center HF driver. For precise coaxial performance, these time-aligned drivers mean there are no dispersion anomalies vertically or horizontally, and the C55's optimal impulse response means excellent frequency response and phase coherency. The resulting sound output is precise and sonically neutral, giving you the most accurate 3-way nearfield experience you've ever heard. It includes magnetic shielding, so it's safe to use next to your computer monitor. From DAWs to large format console mixing, the KS Digital C55 is perfect for any studio. The fast-acting MOSFET power amps are mounted on the back of the speaker, as well as an XLR input, volume control, bass level control, high frequency level control, low frequency bass port, IEC power, and on/off switch. For those engineers who need to hear bass frequencies extended as low as possible, add the B2 or B3 subwoofer... although the C55's perform admirably even without. Step up to a new era of compact 3-way nearfield studio monitoring... the C55 sets a new standard for precision audio. Like all our nearfield studio speakers, the KS Digital C55 is hand-built in Germany for you and comes with a signed Certificate of Authenticity, as well as a full 2-year warranty. … Designed as a full-range studio monitor, this coax with an additional subwoofer delivers a powerful sound at any volume, with no smearing or coloration to the mix. … It’s an almost ideal point source, which at the listening position reproduces a clean sound with no phase distortion. … In home and project studios with more unmusical mixing environments, the C55 shows it true strength by supplying a reliable, honest sound image and great depth. 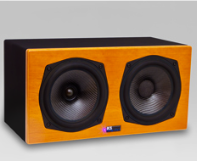 … The 3-way monitors (C55, C88) can absolutely be put in a mid-distance listening field due to their powerful sub driver and amplifier headroom. The sound is impressive, regardless of the volume level. Dimensions H 44 x W 22 x D 22 cm, 17 1/3" x 9" x 9"